As soon as you decide you're going to take a long trip, the most important thing you need to do is give yourself a lot of time. Not two weeks. Not two months. You need at least several months to make this trip worthwhile. I'd say at least five or six months are necessary to get yourself into the groove, to the point where you're cruising along without thinking about home, you're fully enjoying the local cultures and peoples, and you essentially feel like you almost belong there. It's difficult to describe this mentality, but that's really how it feels (see 14. attitude). Some back home may call it an "escape," but I would call it "entry" or some term which refers to an accelerated understanding of the whole travel experience. When you grasp it, you'll know. It’s quite exciting, and I would compare it to the feeling a scientist gets when he makes a great discovery, or the feeling you get when you comprehend a difficult subject. Of course the more time off you give yourself, the better. I met travelers who were on the road for two years, nonstop, and others who were traveling longer, with breaks here and there to earn a little cash. They are among the most curious, self-confident, content and intelligent people I have ever met. They lead very good lives. This brings us to another key to hassle-free, successful travels: don’t tell anyone exactly when you plan on coming back. Do yourself a favor and tell everyone you’ll be back "sometime next year," thus giving you great latitude to let the trip evolve on its own part. This lets you stay longer if you find something (or someone) interesting, or lets you bail out earlier if you’re not having fun, without people calling you a wimp. To bring a friend, to meet a friend, to hook up with others, or to do it on your own... this is a crucial decision to ponder. Taking a round the world trip can be a long, lonely experience if you are by yourself. Some independent travelers head home prematurely because they aren't enjoying their time alone anymore. Others spend a lot of time and money on international telephone calls and Internet email connections, because they miss their friends. This is natural, of course, and I'm not trying to say that you should abandon your friends and family altogether. But remember that these things only bring you back to your life at home, and make it more difficult for you to break into emotional and cultural freedom. This is especially true if you bring a friend with you. Traveling with a companion gives you comfort and safety. Someone to talk to before you go to bed, or during those long bus trips. Someone to watch your stuff in the dorm while you take a shower. Someone to watch your back while you walk the streets at night. Safety in numbers. All of these things are true, of course, but in the analysis that counts, that addressing your personal goals, will a companion really help you get there? Before I left home I agreed to meet up with an old college friend in Bombay. I was planning on spending some time in West Africa beforehand, and at the time it seemed like a good thing to do. We each wanted to head north to the Himalayas of Nepal, so at least we had vaguely similar geographical goals to work with. We hit the travelers' circuit, to Rajasthan, Delhi, Agra, Varanasi, Kathmandu and so on. Everything mentioned above about company, comfort and safety was true. But after a while, even if we didn't come out and say it, we started to get on each other's nerves. We were each at transitional phases in our lives and had a lot of thinking and self-exploration to do. We came to realize that by being together all the time we were preventing ourselves from thinking about and reaching our goals. I personally was very frustrated by the fact that we weren't making very many friends with the locals, as I had done alone on my solo trip in Africa. We also had conflict of agenda. We couldn't decide what we would be doing after we finished our Himalayas trek. My friend kept talking about China, and I kept thinking about Southeast Asia, which was the original plan. You see, by being together constantly, we were having all of our conversations with each other, and none with the locals nor with our own selves, as we both wanted. We weren't even considering the fact that we should go our own ways, because initially we were very dedicated to sticking together at all costs. By the time we realized this, and my friend left for Hong Kong while I left for Dhaka, not only was I regretting having cut my Africa trip short just to meet up with him on time, but we knew that splitting apart was the best option. We certainly enjoyed each other's company, but it was getting overextended. In fact, I was happy to see him go. I was free! Traveling independently, by yourself, is the best way to learn about the countries through which you are passing. Independent travelers have to spend 100% of their conversations on making new friends and meeting new people. Everybody you meet will be new. It’s also easier to approach people, as one person is much less intimidating to locals than two. If you and your buddy are walking around a small village in backwater Burma, for example, the locals might want to talk with you but they will be less inclined to invite you in for dinner or to spend the night than if you were alone. One person would simply be easier for them to deal with. They would only have to prepare one extra dish of food. They'd only have to provide one extra mat and mosquito net for the night. They wouldn't have to worry about what you are saying to your friend, since they would be the only people you are talking with. You'd also be much less conspicuous to the local authorities who, more often than you might expect, show up to object to your presence in the village, mainly for fear of your safety and well being. They think that white people are fragile. As a single visitor, you'd basically be receiving 100% of their hospitality, while they'd be receiving 100% of your attention and appreciation. This is how meaningful friendships are developed. Perhaps most importantly, when you're traveling alone you can do whatever you want to do. No compromises are necessary. If you want to experiment with some "unhygienic" street food, do it. If you want to sleep in the bus station, do it. If you want to hang out with a family for a few days because you've all taken an interest in each other, do it. If you decide, at the spur of the moment, to hop off the bus in an interesting-looking town, do it, with no consequences other than a few cents wasted on a longer bus ticket. In these cases, again, the only person now available to stop you from doing what you want to do is yourself. Maybe your companion would claim to let you do whatever you pleased, but if there wasn't obvious, 100% cooperation on his part, then you'd feel a bit guilty, and you don't need any of that on your personal odyssey. Women travelers may want to address this question differently, for safety reasons. Most independent travelers are young men, but there is an increasing number of women who do it too. None of the women I met complained of severe difficulties in Southeast Asia. The touching and groping stories, which come out from India and the Middle East, simply don't exist here. Travelers of both sexes are universally treated with nothing but the utmost respect and courtesy by Southeast Asians. Women should consider other travelers to be greater threats to them than the locals. Try posting a note on Lonely Planet’s Thorn Tree (www.lonelyplanet.com) inquiring about female safety in specific countries that you wish to visit. The best people to ask about these things are those who have just been there. Now that you're alone and have a lot of time off, make sure that you get your vaccinations up to date. Yellow fever is mandatory for travel in most of Africa and parts of tropical South America, but not Southeast Asia. Cholera is no longer required anywhere in the world, but some border officials in Africa my hassle you for it. In this case, get your physician to write on your certificate (see below) that the cholera vaccination is medically contra-indicated. Hepatitis A and B, typhoid, meningitis, polio and tetanus are all recommended vaccinations for travel in the third world. Hepatitis A and B require a series of 2-3 shots taken over several months to give long-lasting protection. If you leave home before the full series is taken, you should be able to get cheap shots at decent medical facilities in all the major Asian gateways. Consulting a special "Travel Clinic" at major hospitals in the US is not absolutely necessary, since they will simply rubber stamp, at a steep price, what the book tells them. Make sure your physician records these shots on a yellow International Certificate of Vaccination, as approved by the World Health Organization (they should have this form). Yellow fever needs the official stamp of the vaccinating center. Carry this card with you at all times in your money belt. It’s not frequently consulted in Asia anymore, but I needed to prove yellow fever vaccination at all border crossings in West Africa, and upon arrival in Bombay, because I had stamps in my passport from West Africa that were less than six days old. These are likely to be the largest expense for your travel budget, so it’s worth taking some time to ask around. Read the bit about one way tickets in 3. where to go before you continue further here. The key thing to remember about plane tickets is that more middlemen = higher price. If you buy a ticket from Bangkok to Kathmandu from an agent in San Francisco, they’re just buying it from some agent in Bangkok. So, cut costs and do it yourself! For Internet searches of international tickets originating and going anywhere in the world, I highly recommend the European Travel Network at www.etn.nl. You fill out their request form and they forward it to reputable agents all over the world. I also recommend www.priceline.com, which allows you to name the base price (excluding taxes) you are willing to pay for flights originating in the US, then they go out and try to find an airline that will match that offer. More often than not, they do, so start low. Far and away the best places in the world to find cheap deals on international air fares are with travel agents, ticket consolidators and bucket shops in London and Bangkok. Amsterdam, Singapore, Hong Kong and Penang (Malaysia) are close behind. If you’re going to Africa, the Middle East, Eastern Europe, Central or South Asia, it’s frequently cheaper from the US to buy a cheapo ticket to London then shop around when you get there for the continuing flight. Similarly, if you’re going to the Western Pacific, South or Southeast Asia, it’s frequently cheaper from the US to just shop around in Bangkok when you get there. Northeast Asia and Australasia are a toss up. Don’t be swayed by smooth talking travel agents in the US who claim to have found a great deal for your Bangkok-Kathmandu flight. I guarantee you’ll find cheaper ones in Bangkok. South Asia (Indian Subcontinent) is half-way around the world from the US, so going via either London or Bangkok may just be a matter of which coast you live on. Latin America is a different story, and the cheapest deals from the US are likely to be out of Miami or LA. For a thorough treatise on flying cheap, including the option of flying as a courier, check out Fly Cheap!, by Kelly Monaghan. Couriers fly at discount rates in exchange for giving up their luggage space to businesses that need to ship things quickly overseas. Flying as a courier requires great flexibility on your part to leave on short notice and return when they want you to. Personally, I find the potential savings more trouble than they’re worth. A visa is a stamp or sticker in your passport that officially permits you to be in a country. Depending on your nationality, which countries you want to visit and how long you want to stay, a visa may or may not be needed. 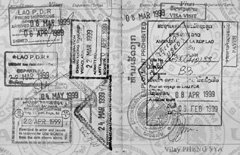 Generally wealthier countries like Thailand, Malaysia, Singapore and Brunei have more lax visa regulations, where securing a free, standard 30 day tourist visa is no more difficult than showing up at the border or airport, while the less-developed, poorer countries all require that you purchase a visa ahead of time at one of their embassies or consulates in another country. With a few exceptions, citizens of North America or Western Europe will have few problems getting a one-month visa to anywhere east of the Middle East. Embassies are almost always located in the capital city (Cote d’Ivoire and Nigeria are two exceptions which come to mind), whereas consulates are occasionally located in other major cities. If you are flying into a country that needs a visa, is it up to you to make sure that you have it before you arrive. If flying into Jakarta from the US, for example, you need to contact the Indonesian Embassy in Washington and apply for a visa. It’s best to do this at least 2 months prior to departure, since the process can get quite involved. For contact information on all foreign embassies in Washington, check out www.embassy.org. Your passport will look like this after a while. Before you leave home, you only need to worry about visa regulations for the country you are flying into. Beyond that, all subsequent visas can be obtained as you travel. Bangkok is a convenient place to arrange visas to Indochina, Myanmar or South Asia, since most countries have embassies there. Travel agents will often get visas for you, but it’s always cheapest to go to the embassy and arrange the visa yourself. Bring several black and white or color passport-sized photos for the application (see 5. what to bring). Even if you only plan on being a country for a few days, it’s a good idea to request a longer stay just in case something comes up (like if you make some good friends). I always request the maximum number of days for the standard tourist visa. When you pick up your passport afterwards, make sure the visa is valid for the dates and length of stay which you specified in your application. Visas on the road invariably can be paid for with US dollars cash, but ask if they’ll take the local currency instead. Sometimes the price they quote is not up to par with the current exchange rate. Visa fees and regulations for a particular country vary widely from one embassy to another and in time, so it’s pointless to list details here. The best thing to do is ask other travelers where they purchased their visas and how much they paid, then decide for yourself what’s best. Finally, if you’re planning on getting a visa to a particular country in a particular city, always make sure that country has an embassy there beforehand. The best way to do this is by scoping out the guidebooks. The same rule applies here as with any type of insurance. It would be ideal to have it if something happened, but it’s prohibitively expensive for the shoestring world traveler. Hundreds of dollars spent on health insurance could cut your trip short by several months. I never had it, probably should have, but never regretted not having it. If you keep yourself fit by active exploring on foot and on bike, be sensible about what you eat and drink, and sleep under a mosquito net, you should come through in one piece. Random, freak accidents can happen to you at home just as easily as they can on the road. Therefore, if you don’t have health insurance at home, the "just in case" excuse is not good enough. I’d recommend that you get health insurance if you can afford it, otherwise it’s up to you. Above all, the most important advice regarding your well-being on the road is that you need to watch out for yourself at all times, and not do really stupid things (like cliff diving or riding in a car with drunk Indians). If you’re genuinely worried about losing some possession or having it stolen, I’d recommend that you not bring it. This way, baggage insurance is unnecessary and no amount of theft is going to set you back or hinder your spirits. I set off for Ghana with a fancy, $100+ automatic camera in my backpack, only to discover when I arrived that it had been stolen en-route from my checked bag. I was mad at the time, but in retrospect it was a good thing because I had less stuff to worry about. I bought a cheapo self-wind camera in Abidjan and still brought back great pictures. Later, when my alarm clock was snatched from my bag on the overnight train to Agra from Delhi, I felt the same way, and realized that I didn’t really need it anyhow. Good riddens! 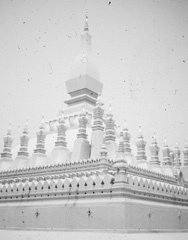 Pha That Luang (Vientiane, Laos).